Fallout is the most dangerous in the first few hours after the detonation when it is giving off the highest levels of radiation. It takes time for fallout to arrive back to ground level, often more than 15 minutes for areas outside of the immediate blast damage zones. 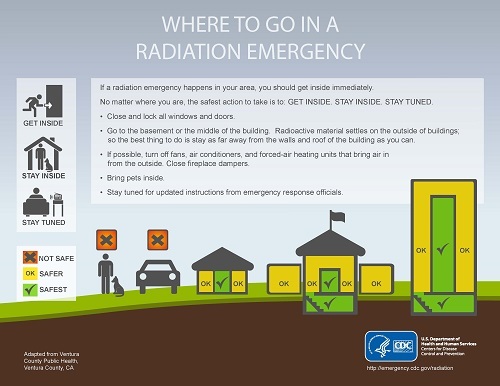 This is enough time for you to be able to prevent significant radiation exposure by following these simple steps: GET INSIDE, STAY INSIDE, STAY TUNED. Download an emergency supply checklist. 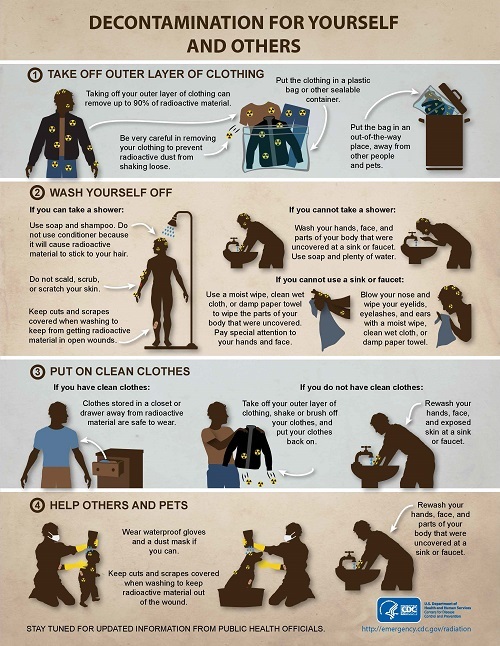 To learn more, visit https://www.cdc.gov/phpr/areyouprepared/kit.htm and https://www.ready.gov/build-a-kit. If warned of an imminent attack, immediately get inside the nearest concrete building and move away from windows. This will help provide protection from the blast, heat, and radiation of the detonation. Expect to stay inside for at least 24 hours unless otherwise told by authorities. It is safe to eat or drink packaged food items or items that were inside a building. Do not consume food or liquids that were outdoors uncovered and may be contaminated by fallout. Do not drink water from tap sources. 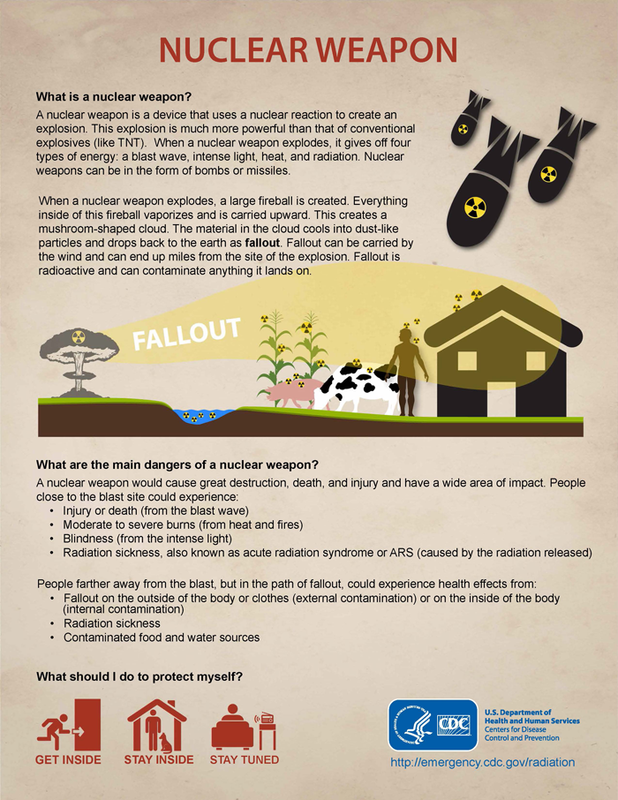 For more information on how you can prepare for a nuclear explosion, visit https://www.ready.gov/nuclear-explosion and https://emergency.cdc.gov/radiation/index.asp. To learn more visit, https://www.ready.gov/hazardous-materials-incidents. To learn more, visit https://www.dhs.gov/topic/weapons-mass-destruction. An RDD combines a conventional explosive device – such as a bomb – with radioactive material. It is designed to scatter dangerous and sub-lethal amounts of radioactive material over a general area. Such RDDs appeal to terrorists because they require limited technical knowledge to build and deploy compared to a nuclear device. The size of the affected area and the level of destruction caused by an RDD would depend on the sophistication and size of the conventional bomb and other factors. The area affected could be placed off-limits to the public for several months. For more information on how you can prepare for an RDD event, visit https://www.ready.gov/radiological-dispersion-device.